Detroit sits on lakes representing 20% of the world’s fresh water – yet a staggering 100,000 households have had their water shut off. At an average 2.7 people per household, that’s over 250,000 people out of a population of just under 700,000 – and 17,000 more households are facing having their water cut off in the next few months, although some activists believe it could be nearer 25,000. Many people have been denied water for three years. Meanwhile water giant Nestlé pays just $200 a year to the state of Michigan to take 200 million gallons A SECOND out of the great lakes, which they then sell back to people without water at huge profits. The tactics and legal setups to stop the people of Detroit from drinking their own water are very similar to those that stop the people of Palestine drinking from their water source. 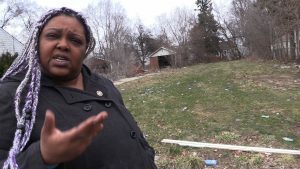 Reverend Roslyn Bouier runs a food pantry where you can pick up free food and water in Brightmoor, one of the most disenfranchised neighbourhoods in Detroit. She told us that many of her clients have two jobs and still don’t make enough money to pay their water bills. Water rates have gone up 126% in the last 10 years, which means that many people are expected to pay $150 – $250 a month (£115 – £190) for water – around 10% of the average salary. 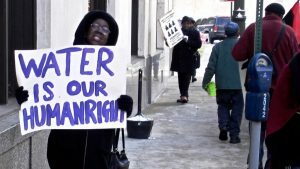 The rates for the 83% black population are way higher than the neighbouring mainly white suburbs – Oakland county to the North is the richest county in the USA, 95% white, and with many outstanding water bills, but have had no water shutoffs. The rich are not affected either – the Ford family owe $50,000 in unpaid water bills, the city golf course $400,000, but they’re not getting their water shut off. The bills are exacerbated by numerous mistakes being made by an increasingly chaotic water department. Water activist Nicole Hill told us that she received a bill one month for $3,000 – when she went to the office to say that it must be a mistake, they came back and told her it had gone up to $5,000 in the space of a morning., but expected her to pay it anyway. 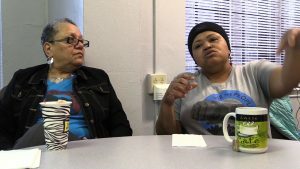 Nicole ended up having her water shut off, and had to send her children away to live somewhere else temporarily – if you get your water shut off, you can get their children taken away from you for living in an unsanitary environment. Nicole has got her water back on now after refusing to give in, but the debt was never rescinded so she has had to declare herself bankrupt. Many people are getting into serious trouble. Not only can you lose your children, but you can easily be charged with neglect and arrested for having children live in unsanitary conditions. Roslyn knows many people who have been arrested over a weekend, couldn’t pay the bond to get out of jail and have ended up losing their job. If you’re convicted, when you leave prison you can’t get a job, a house or food stamps. This is a deliberate and brutal strategy to accelerate the gentrification of inner city Detroit by forcing people out of their homes. You’re not compensated for your property – because you left it. So then property developers can get the land for virtually nothing and gentrify it. 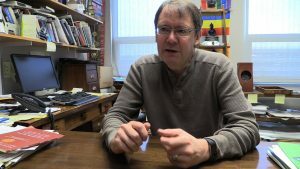 Dr Peter Hammer, director of Damon J Keith centre for civil rights at Wayne State University, explained how Flint’s water was ruined too. Flint used to get clean water from Detroit, but then a pipeline to provide a new water source got approved. They raised hundreds of millions to get the pipeline, while not upgrading the water treatment plant. So then they diverted the money they were spending to get clean water from Detroit on the water treatment plant and in the interim (2 years) take water out of the Flint river – which is completely contaminated, due to all the industrial pollutants in it. The water treatment improvements were not made, which led to lots of illnesses. The water was opaque. People were losing hair, developing rashes – then people tried boiling water (often people whose first language was not English, and so didn’t understand the situation) which increased the metal concentration. People started dying from legionella disease from bacteria breeding in the water source. All this information was suppressed by the authorities. People took water samples themselves to universities to do the research and it was only when scientists proved that lead levels in the water violated Environmental Protection Agency guidelines that attention was drawn to the problem. After a huge struggle Flint now has a clean source of water again, having gone back to the Detroit water and sewer system – but the corrosion in an already aged infrastructure is difficult to repair. The same corrosion has destroyed the plumbing inside houses, and no-one is addressing that. There is permanent neurological damage to children from lead, and housing prices are going down because of the water quality. Detroit used to represent hope for black Americans. You could migrate away from the South and extreme poverty to a city with well paid jobs in a car industry with strong, militant unions. But the state resented the increase in black wealth and political power, and “white flight” started to the suburbs. After the Coleman Young era of black political power (mayor of Detroit from 1974 – 1994), they made sure that the narrative of black people not being able to run their own affairs was made true. The auto industry moved to places where they could pay lower wages and not have to deal with strong unions – first to the suburbs, then to the South, then out of the country. Unemployment soared, and then the drug trade moved in, leading to crime and poverty. After having the highest percentage of black home ownership in the country, 100,000 households were illegally foreclosed, 80% of them on low income – the largest displacement of black homeowners in the world after Johannesburg. So now the city was losing revenue in property tax as well as corporation tax and income tax. Property developers moved in for the abandoned houses. One such is Dan Gilbert, who owns Quicken Loans and the Cleveland Cavaliers. He has two federal lawsuits for predatory lending practises, and is being gifted land in the city when he is one the main drivers of displacement and foreclosures. Divestment from education was used to accelerate gentrification. Over hundred schools were closed in just one year with no adequate transport to get children to other schools, forcing more people out. Dan Gilbert owns Quicken Loans and the Cleveland Cavaliers, has two federal lawsuits for predatory lending practises, and is being gifted land in the city when he is one the main drivers of displacement and foreclosures. Stimulus dollars allocated by the Obama administration (intended for use to relieve poverty, weatherproof homes etc) were shifted into a blight fund which has turned into a slush fund for property developers. $200 million in a school aid fund is now being used by Dan Gilbert to subsidise his development activities. A $400 million tax subsidy to build the hockey arena was given to a billionaire who already owns multiple sports companies. Hundreds of millions was spent on a train to service downtown, siphoned from the public transport system and supposed to be used to extend the system outwards to poorer communities. In 2013 Detroit was erroneously declared bankrupt. The state intervened by imposing emergency management, taking away the democratic rights of people to elect their own officials. The emergency manager decided to clean up the books of the water dept by cutting off water. The debt could have been restructured during bankruptcy to get rid of two thirds of it – but it wasn’t. Monica Lewis Patrick and Debra Taylor are activists in We The People of Detroit, and previously worked for the city councillor the Honourable Jo Ann Watson. They explained that the water dept knew back in 1955 that if they continued building water infrastructure, forced by state of Michigan, it would leave the city destitute. The water system was owned by Detroit, even though it provided water for half the state of Michigan – but the state didn’t allow them to make money out of it, only to recover costs, so Detroit was subsidising the rest of the state. When Detroit was put into bankruptcy, control of the water passed to the region, with the wealthier white suburbs having the majority vote. So it keeps Detroit from leveraging a prime asset in a city with a lack of resources. There are many more injustices, one being Detroit’s ability to negotiate health care for employees. Blue Cross Blue Shield was charging the city $300 million dollars, when it could have been provided by 5 national insurance companies for $100 million. There is speculation that the governor of the state of Michigan and the sitting mayor then used the $300 million as a slush fund to pay their cronies. Michigan state and other creditors owed the city of Detroit $2.2 billion but didn’t pay it. 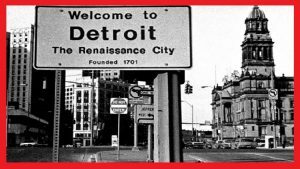 If the legal construct of bankruptcy had been fairly and equitably applied, even in a financial downturn Detroit would have been in the black. It was about stealing the most valuable asset in the USA – fresh water. The head of the water dept Gary Brown, the former mayor Dave Bing, and the governor of the state of Michigan all invest in energy company DTE – who are going to need access to a lot of fresh water for their fracking activities. Now 70% of the population that works in the city doesn’t live in the city, benefiting from austerity imposed on black people. But as Monica pointed out, “If we allow them to put us into a racialised fight,we lose.” The attacks are clearly part of a global trend by banks and multi-bilionaires to buy up water all over the world. Instead, We The People of Detroit have built a movement based on class unity across races and cultures. They did research that showed the correlation between water shutoffs and publc health. Every day for three and a half years, they have been delivering water by setting up emergency water stations. 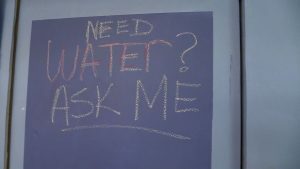 The first one was set up in 2014 in a block with 44 homes shut off from water. One of the tenants, Valerie Jean and her husband, who was struggling with their own foreclosure and with 6 children, allowed their house to be used as a water station. Young black men, the sort who are demonised by the state, were the ones taking heavy containers of water up and down stairs to people who were sick, disabled and elderly. The tenants then created a pot where people paid $10 -$20 a month in for people to use to pay for their water. There is also resistance to stop water being shut off. 9 people escaped prosecution for standing in front of trucks coming to shut off the water. One of the 9 was Pastor Bill Wylie-Kellerman, who when a group of young black activists said they would stop the trucks pointed out that they would probably be met with lethal violence so volunteered to stand in front himself as a white pastor. The nine, many of them in their 70s, laid in front of trucks and stopped them for 8 hours. They tried to impose 10 year sentences but two or three dozen attorneys worked on it and got them off after a three year struggle.